A Soyuz rocket on the pad for a joint Roscosmos-Arianespace launch at Guiana Space Center in 2011. Early risers on Wednesday are eligible to observe a rocket launch double header, with multinational company Arianespace planning to launch an Ariane 5 rocket carrying four Galileo GPS satellites for European customers at 7:25am ET and a SpaceX Falcon 9 launch carrying 10 Iridium satellites 15 minutes later at 7:39am ET. 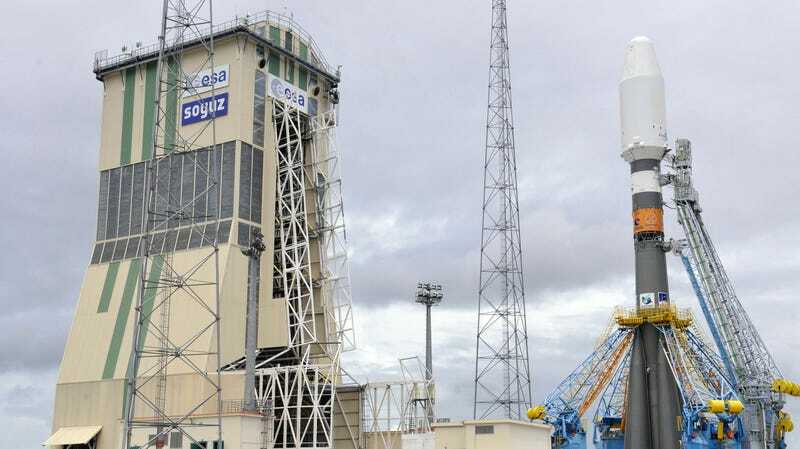 Per Space.com, the Arianespace launch will take place near the Atlantic coast of South America at Guiana Space Center in Kourou, French Guiana. SpaceX’s rocket will take off from Vandenberg Air Force Base in California following a successful test fire of the rocket last week, and it will attempt to land on a drone ship titled “Just Read the Instructions” shortly after. Space.com noted that a second ship, Mr. Steven, may be dispatched to capture the rocket’s fairing with an upgraded net after a yet another failed attempt in June. SpaceX has been running a fairly fast-paced launch schedule, having launched a Telstar communications satellite on Sunday on a newer Falcon 9 iteration and scheduling another for August 2nd. Arianespace’s expendable Ariane 5 ES rocket is significantly older, per Ars Technica, with the line dating to 1996 and scheduled for phasing out in 2022. The still-in-development Ariane 6 will be intended to compete with SpaceX’s cheaper reusable launch systems, though it is likely that by the time it debuts the latter company will have significantly bypassed it on cost savings. Live streams for both launches are embedded below, though if you’re not an early bird, both videos should continue to play back afterwards.